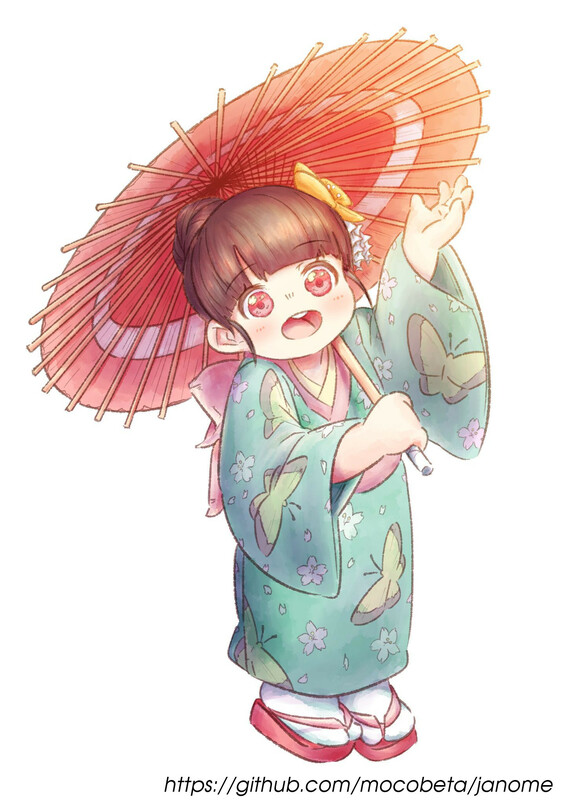 Illustration by janome. All rights reserved. Janome (蛇の目) is a Japanese morphological analysis engine (or tokenizer, pos-tagger) written in pure Python including the built-in dictionary and the language model. We aim to build a library which is easy to install and provides concise, well-designed APIs for various python applications. Janome uses mecab-ipadic-2.7.0-20070801 as the built-in dictionary. Also Japanese new era “令和” (Reiwa) has been added to the dictionary since v0.3.8. This requires 500 to 600 MB RAM for pre-compiling the dictionary data. Create janome.tokenizer.Tokenizer object and call tokenize() method with the sentences you want to analyze. The return value is a list of Token objects. Token includes morphologic information such as surface form, part-of-speech. See reference for more details. 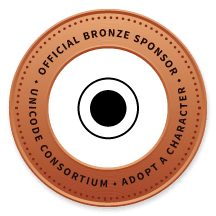 Use decode('utf8') if the output is garbled. You can add custom entries besides the built-in dictionary at runtime by using user defined dictionary. Default dictionary format is equal to MeCab IPADIC format. Create a CSV file as below and pass the file path and the character encoding to Tokenizer’s constructor. See the MeCab document for more details. Janome provides alternative simplified dictionary format similar to Kuromoji user dictionary. This format supports surface form, part-of-speech and reading only. To use simplified dictionary format, create a CSV file that includes “<surface form>,<part-of-speech>,<reading>” in each line (see the example below) and pass the file path and the dictionary type (udic_type='simpledic') to Tokenizer’s constructor. With large user dictionary, it can take much time to convert CSV file to the binary data structure. You can compile the user dictionary in advance and use that at runtime. For now, there is no tools for compiling user dictionary. Use APIs as below. Once compiling has been successfully completed, the data is saved in /tmp/userdic directory. Pass the directory path to Tokenizer’s constructor to use it. Use same major python version at both compile time and runtime. Forward/backward dictionary data compatibility is not guaranteed. Analyzer framework is for pre- and post- processing. Analyzer framework includes following classes. CharFilter class performs pre-processing such as character normalization. TokenFilter class performs post-processing such as lowercase/uppercase conversion, token filtering by POS tags. Analyzer class combines CharFilters, a Tokenizer and TokenFilters to assemble custom analysis chain. You can count word frequencies in the input text by using TokenCountFilter. See API reference for other built-in CharFilters and TokenFilters. You can implement custom filters by extending CharFilter or TokenFilter. When stream = True option is given to tokenize() method, it runs on streaming mode. On streaming mode, partial analyzed results are returned through generator interface. Use this option when you analyze very large text data. When ‘wakati = True’ option is given to tokenize() method, it runs on ‘wakati-gaki’ (‘分かち書き’) mode. On wakati-gaki mode, tokenize() method returns sufrace forms only. Return type is a list of string, not list of Token. If you use ‘wakati-gaki’ mode only, it is recommended to give wakati = True option to Tokenizer.__init__(). When Tokenizer object is initialized as below, extra information (detailed part of speech, reading, etc.) for tokens are not loaded from dictionary so the memory usage is reduced. ‘wakati-gaki’ mode works well with streaming mode. tokenize() method returns generator of string when it is given stream=True and wakati=True options. If mmap=True option is given to Tokenizer.__init__(), dictionary entries are not loaded to process space but searched through memory-mapped file. When dotfile=<dotfile output path> option is given, Tokenizer.tokenize() method converts the lattice graph to Graphviz DOT file. For performance reasons, this option is ignored when running on streaming mode or analyzing very long text. 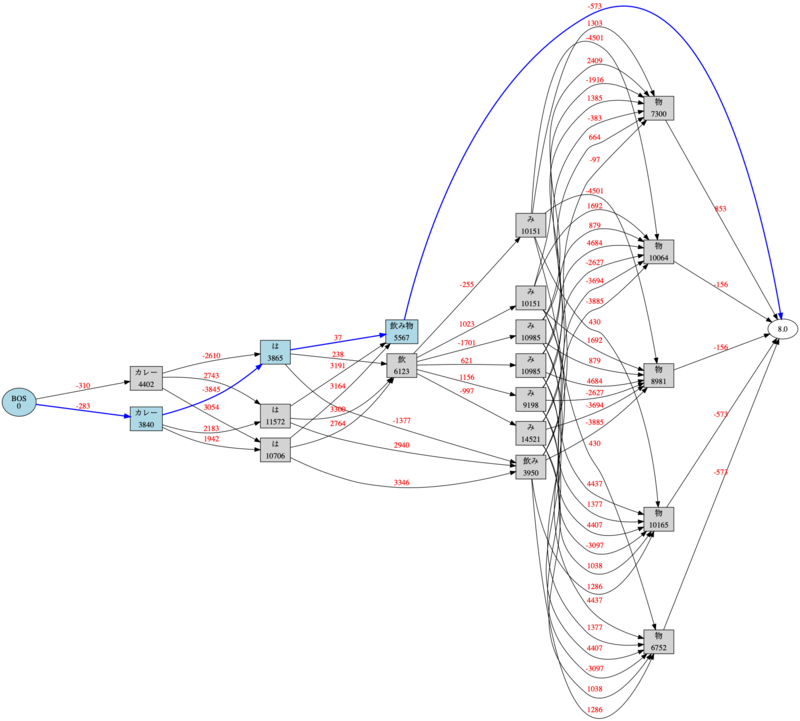 janome command (the details are mentioned later) has options to visualize the lattice graph easily. Janome has executable built-in script “janome” for command-line usage. It reads a sentence at a time from standard input and outputs the analyzed results. To see supported options, type “janome -h”. Use -e sjis option if the output is garbled. You need Graphviz to use this functionality. Please install Graphviz from here. If given -g option, janome command outputs the visualized lattice image to the current directory after analyzing the text. Default output format is PNG. You can change the output file location by using --gv-out option. Also you can specify the output file format by --gv-format option. See Graphviz documentation for all supported output formats. This memory leak problem was solved at v0.3. The analyzed results with version 0.3 or over can be a bit different from ones with version 0.2. You may want to examine streaming and/or wakati-gaki mode to reduce memory usage more. In older version (< 0.3), Janome can consume large memory when a very large document is passed all at once. Please split large documents (larger than tens of killobytes) into small chunks or sentences. How is the accuracy of analysis? Janome uses MeCab IPADIC dictionary, so the accuracy is roughly same to MeCab. How is the speed of analysis? Basically depends on the input length. According to my benchmark script, one sentence would take a few milliseconds to a few tens of milliseconds on commodity PCs. What data structures and algorithms are used? Janome uses FST (Minimal Acyclic Subsequential Transducer) for internal dictionary data structure. I implemented the automaton by referring to Apache Lucene (written in Java) and kagome (written in Go). And for analysis engine, I implemented basic viterbi algorithm by referring the book 自然言語処理の基礎 . I found bugs. Or have requests for enhancement. Bug reports or requests (and of course, patches) are welcome. Create issues in Github repository or leave your comment to Gitter room. Licensed under Apache License 2.0 and uses the MeCab-IPADIC dictionary/statistical model. See LICENSE.txt and NOTICE.txt for license details. Copyright(C) 2015, Tomoko Uchida. All rights reserved. © Copyright 2015, Tomoko Uchida. Created using Sphinx 1.8.4.